tokyo-based firm florian busch architects has shared with us their recently completed ”A’ house in kisami’ within the shizuoka region of japan. located at the tip of the izu peninsula, the retreat contrasts the owner’s bustling life of tokyo, approximately 180 kilometers north of the area. positioned on a steep coastal hill, the structure overlooks the ocean and opens to the sights and sounds of the sea. the majority of the site’s terrain underfoot is inclined to a 30 degree angle, requiring initial carving of the earth to inset two stacked volumes. the trapezoidal footprints are rotated along a common central axis to form a central void, where the a spa zone has been inserted. Then she will be beautiful. Please let the concrete be just concrete. Please keep the concrete, concrete. Great design.the rawness adds more flavour to it!!! 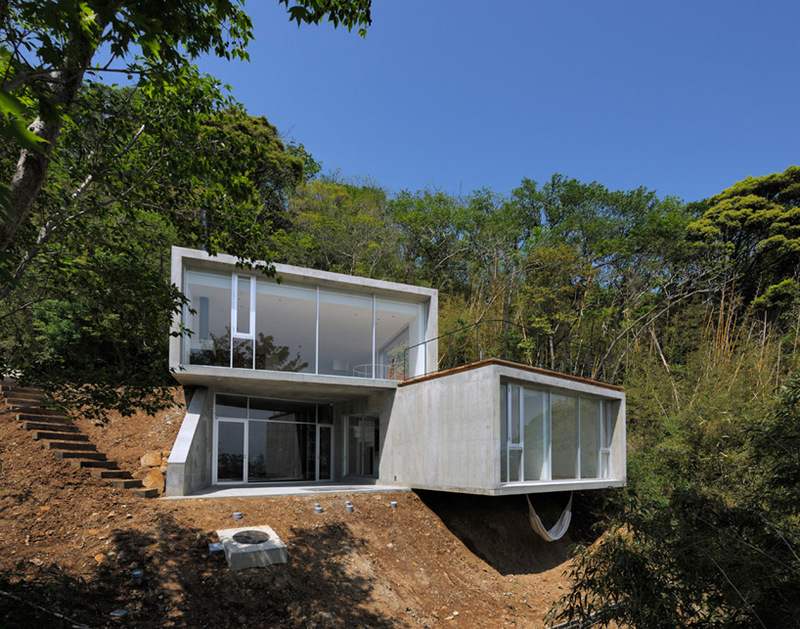 the concrete adds an unpretentious feel to a simplisticly elegant design….BRAVO! I WANY ONE…WHERE DO I SIGN? Please lay more concrete onto the concrete, and keep it as concrete.